There’s plenty of Apple product placement in a movie told entirely within the confines of technological windows on computers, laptops and cell phones. 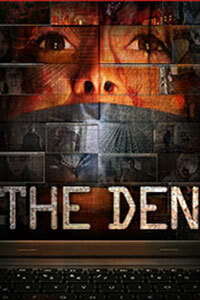 But there are also bonafide chills to be found within THE DEN’s taut, well played suspense narrative. Pretty L.A. sociology student Melanie Papalia is studying human behaviour in an online context via a Skype-like service named “Den Chat”. Initially attracting all the expected perverts and saddoes, she has her computer hacked and is forced to endure apparently genuine footage of a woman being tortured. The cops assume it’s a hoax, but the perpetrator undergoes a campaign of terror via technology that starts to threaten her loved ones. A 21st century update of REAR WINDOW, THE DEN’s alarmist approach is based around how easy it is to murder people in the internet age – with a streak of light satire poking fun at the hopeless & horny and Nigerian scam-artists. It builds an increasing sense of unease via insidiously creepy scenes of the killer invading both the heroine’s home and her computer, and the grim climax is in the nihilistic spirit of the outstanding MEGAN IS MISSING. In the closing moments, the movie breaks from the first person vantage point for the first time…and uses it to deliver perhaps the most disturbing moment of all.